As well as offering steel products and steel fabrication, at Nottingham Steel Supplies we’re able to arrange a steel installation service with our orders. This takes the worry out of installing the steel beams, reinforcement or any other steel products that you have bought from us. Our staff are all fully trained and certified in the installation of structural steel, meaning you can let an expert do the work for you. As with the rest of the products and services that we offer, we pride ourselves on being able to offer fast turnaround times to our customers when it comes to steel installation – meaning that your project won’t be delayed. 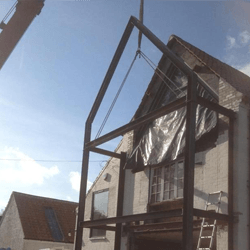 Our staff are able to arrange an on-site steel erection service and work in line with industry regulations meaning that you can rest assured that your project will run smoothly and without any issues down the line. We’re committed to providing the best steel products and fabrication service and to helping our customers by offering a fantastic installation service to keep the project on track. If you require our steel installation service, you can call our dedicated team on 0115 940 4949 and they will be able to discuss timeframes and availability with you.